This entry ends with the video of Mike Timlin talking about how selfless Tim Wakefield was a player…I’ve probably watched it twenty times today. It’s a wonderful testament to the type of person he is. I missed the Tim Wakefield press conference live. Had to run out so I hit record on the DVR. As I started watching it about an hour later I immediately started crying. Didn’t even wait for Tom Werner to start talking, the tears just started to flow. We’ve been fortunate as fans to be able to watch Tim Wakefield pitch. I don’t care if he isn’t a Hall of Fame pitcher; he’s someone you genuinely wanted to do well. He made a lot of sacrifices for the team. He didn’t let his ego get in the way of the team winning and there aren’t that many players you can say that about. Not blogging…heck in July I’ll have seven years of blogging under my belt. But today is a baseball-related anniversary just the same: Today will be the fifth time I actually make it into Fenway for Truck Day! I thought my fifth anniversary would be a good day to share some photos I’ve taken from my four previous Truck Days! 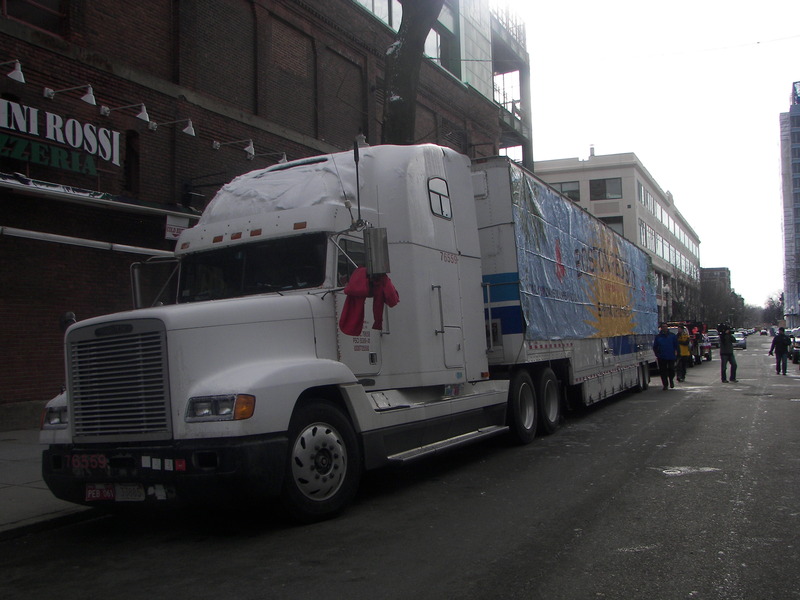 The first year I went the equipment truck was sitting on Yawkey Way. There were genuinely more reporters than fans (if I write that there were fifty fans I’m probably exaggerating) and I got myself on a couple of Saturday night newscasts because the reporters had such a small pool of fans to interview. It was the Truck Day after the Red Sox won the World Series – again – and we were really excited for the season to begin. I feel like I should at least make mention of the Patriots since I know many of you aren’t just Red Sox fans but Pats fans as well. While definitely a fan of them, football is not that sport that grips me and owns my heart. I remember when they lost to the Giants LAST time that I was actually surprised at how upset I was because I can usually just enjoy the game and not obsess too much on the outcome…but that game really stung. I think the connection with other fans and with opposing fans thanks to the Internet makes these kind of losses even more difficult…no one wants to deal with the opposing fans gloating over your pain…but now that pretty much comes with the territory. So I will admit fully to dropping an f-bomb or two last night and to being disappointed with the loss. But I have a really tough time being mad or even terribly upset. Since the beginning of this Millennium alone, our teams have collectively won seven titles. In my lifetime they’ve won 15. The idea that any New England sports fan should hang their head is ridiculous. We have a lot to appreciate and a lot more to look forward to, so don’t let anyone make you think differently. For all of you suffering this morning, I offer sincere condolences and I feel you pain. I know for me when the Red Sox season ended so terribly every time someone said to me “At least there’s the Celtics/Bruins/Patriots” my response was “As much as I like other sports, they don’t replace the loss of baseball for me” and that’s true. So while I lament how the season ended for Patriots fans I offer two glimmers of hope, one football-related and one not: Our team got to the Super Bowl which is more than the majority of football fans can say this year. That’s a lot to be proud of regardless of the final score. 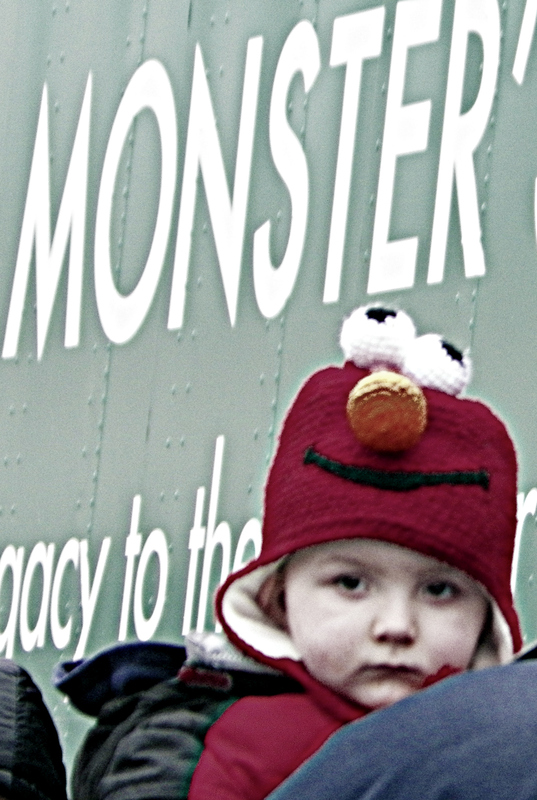 And this…Truck Day is this Saturday or, as so many of my friends with young children would say, five sleeps and a wake up and Truck Day is upon us! The best thing about baseball is that we get 162 games to lead us into the playoffs. The football season goes by so fast that the way it ends (unless your team wins the Super Bowl) is always a kick in the stomach. As baseball fans we get to enjoy the slow burn and we get to hold on to hope for a lot longer than most other sports fans. That definitely is something worth looking forward to, isn’t it? I’m going to write about Josh Hamilton. I promised myself I wouldn’t. Told myself to just shut up about it because everyone has an opinion and mine will probably offend a good portion of society and what purpose will it serve anyway? So I decided the safe way to go would be to just ignore what’s going on with Josh Hamilton and let everyone else praise him or bash him or whatever comes in between the two. But that really isn’t me. So this is your warning…as well as your spoiler alert because I can save some (most?) of you a lot of time by telling you that what I’m going to write about Josh Hamilton at the least won’t be complimentary and at worst might just genuinely offend some folks. Now that I’ve done that, I’ll proceed.